The DNA testing services offered by Therion International can dramatically enhance your ability to address research questions in animal behavior, ecology and conservation biology. The determination of paternity, parentage and degree of relatedness is important in many studies of reproductive strategy and social behavior. In addition, obtaining data on the genetic parameters of populations is essential when designing programs for the conservation, reintroduction and management of wildlife species. Therion offers a full range of DNA-based testing services including DNA profile testing, DNA amplification and sequencing. Using our proprietary multi-locus probes (OPT-series) or single locus microsatellites we have successfully analyzed samples from well over 350 species/breeds of animals. Depicted on this fact sheet are examples of results produced from several studies relating to animal behavior, ecology or conservation biology. In a study of mating/reproductive strategies in scarlet and Waldrapp ibises it was essential to verify parentage of alleged offspring of mated pairs. The autoradiograph at right depicts the DNA profiles of a nesting pair of scarlet ibises and their chick. Note that each genetic marker observed in the DNA profile of the chick can also be observed in the DNA profile of one or both adults thus verifying parentage. No scarlet ibis chicks were found to be the product of an extra pair copulation, however some Waldrapp chicks were excluded from being the offspring of the mated pair who's nest they were found in. In cooperation with several bald eagle ecology and recovery programs, a bald eagle genetic database is being compiled to estimate levels of genetic variation within and among populations. To date over 300 samples have been submitted by field scientists studying resident populations throughout North America. DNA profiles were prepared using restriction enzyme Hae III and Therions multi-locus probes OPT-03, OPT-04 and OPT-05. The figure at right depicts the DNA profiles of two siblings (P1S1, P1S2), another bald eagle from the same population (P1) and a single individual from a different population (P2). The lane labelled MWSS contains molecular weight sizing standards. Note the varying degrees of similarities among the banding patterns. Therion has developed computer softwares to calculate band-sharing coefficients and estimate heterozygosity and genetic distance from these data. 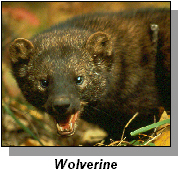 Band-sharing coefficients (indices of similarity) were generated for a small population of captive wolverines to (1) estimate the amount of genetic variation within the population and (2) enhance the breeding management program to maintain existing genetic variation. The figure below shows band sharing coefficients for each dyadic comparison of wolverines. Results from this probe/enzyme combination and from a second independent assay suggested a low level of genetic variability within the population. Most band-sharing coefficients were greater than .50, the level expected for first order relatives. From these data recommendations could be made as to which male-female dyads to pair (or avoid pairing) for breeding. Download the Adobe Acrobat version of this page (animalbe.pdf).